This businesswoman travels all over the world presenting facts to important people with regards to the Army. She has just had her colored with a previous stylist that was doing hair at home in the kitchen. She was doing this for about a year. 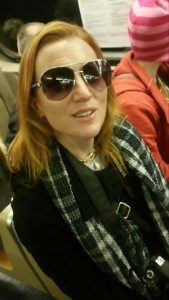 The picture of Brenda on the left is her before photo that she normally had a golden copper hair color. 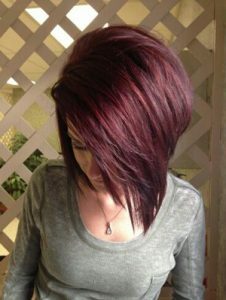 She wanted to go with a dark red violet burgundy hair color for a change. She likes vibrancy. She showed us the color choices that she would be happy with. Her hair texture was fine. Her ends were compromised because of the well water that her hair was exposed to for many years. We had a discussion on the facts surrounding well water and what it can do to hair color. The 2nd photo in the middle is what she had received after her last session with the stylist. Streaks of color that were nothing like she wanted in the last photo on the right. 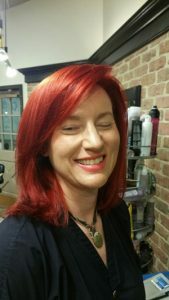 In order to give Brenda what she wanted, we had to remove her current coppery red hair color that had many different colors throughout the hair to even it out. This didn’t mean she wouldn’t have dimension but it would mean we could start from a different level of hair to get her where she wanted to be. We then had to fill her hair with the proper red tone. Filling hair is like priming a wall with a color before the desired paint color. It fills the empty spaces of hair that needed to be filled and prevent the hair color from dulling or fading out over time. We had to see how the color would take in the hair on the different textures or porosities of hair. We cannot guarantee results until we actually see the results from application. This process may take stages to achieve the perfect results. In some cases, the hair will not allow us to proceed due to the hair not accepting color as necessary. 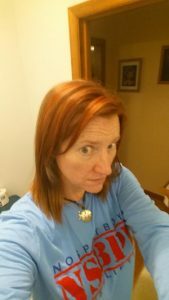 At that point, we would have to have a plan B to work with until the hair is healthy enough to try the original desired red hair color. 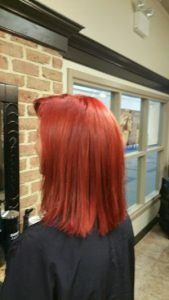 As you can see the AFTER photos are such a vibrant true red hair color that she is happy with. We did discuss the variations of the color that she would be happy with when we held up swatches of color tones her skin tone. This made the biggest difference in her choice for that day vs her desired results she wanted when she came in originally. 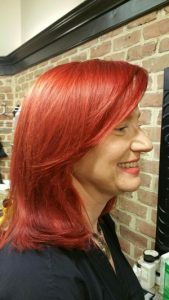 Look at the evenness of hair color, As part of our service, we discussed the fact did she or did she not wear makeup daily. We updated her makeup color choices, her makeup foundation with Glo Minerals makeup (link Glominerals makeup to our webpage makeup) because it has a natural light weight. She wanted to not have her makeup feel heavy and have an overall polished professional look. We shaded in her brows to give her a more balanced look. This was so fun! 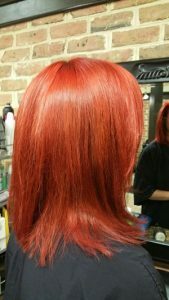 Brenda’s red hair color has incredible shine, even red tone, and very healthy appearance. As part of the consultation, we talked about her home maintenance program with shampoo, conditioners and using the right styling products to protect her hair color. We always recommend Pureology 21 Benefits that has vitamins that are infused into the hair to prevent loss of red hair color. We utilize other home maintenance products customized for your hair.